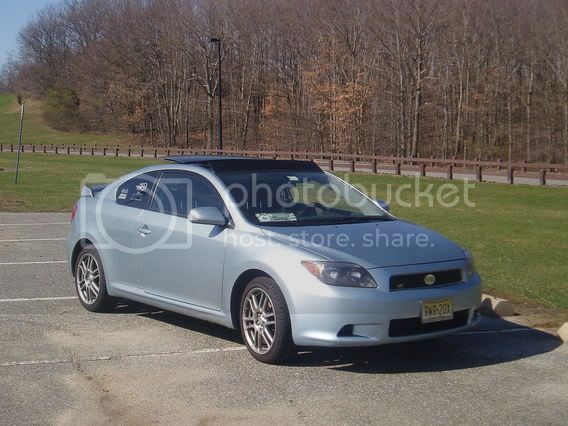 Scionlife.com - Azure Pearl Owners Unite...lol. yeah but to me these are much CooLeR! At least these threads are limited to the Scion color line...... the tC vs. ____ threads are ENDLESS. mine looks just like yours... anyways whats the point to post pictures of the stock tC on tC forum, c'mon people, please don't do it anymore. Sould be in a rules as no posting that kind of stuff as well as no vs threads. people are just proud of their cars, is that such a bad thing? Not posting pics for a bit yet, will do a few more mods first. I got a AUTO AP ..... best color of them alllll , and very unique. I love it. Have pics of many mods but im to lazt to post em !! I liked the AP, cept I liked the FM better and was told that if I got an AP I would never here the end of it for getting a 'chicks color' from friends. AP: present and accounted for. Pics of my car with the tint, so far here's my mods. Door Sill enhancements, OBX Sport Pedals, OBX Speed Star Shift Knob (Mesh), iPod2Car adapter, TRD Exhaust, Scion Cargo net, 17% window tint all around. Planned: TRD Suspension (complete strut, sway, springs set), S/C (if and when), and possibly some other things. I think the bug itself is a chicks car, no matter the color. However, that appears to be a pale blue, and while that might look similar to the AP in pictures, the AP never photographs well. Bought my AP 5-speed w/SRS right off the showroom floor. I absolutely love the color, and as of last check, I am not a girl. In fact, I have received more compliments from dudes about the color of my car. Chicks dig it too!